Arn is a Cambodian-American human-rights activist. He is the founder of Cambodian Living Arts, a nonprofit that honors and supports Cambodian traditional arts, which were in danger of being lost as a result of the Khmer Rouge (Pol Pot) regime. But if you want the full story—with all of its awful, gory, gut-wrenching details—then you can read Never Fall Down. 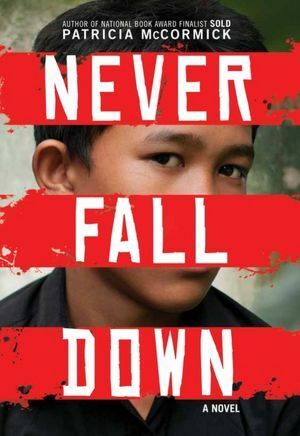 Never Fall Down is the story of Arn’s involvement with the Khmer Rouge, the radical Communist group responsible for a massive genocide in Cambodia in the 1970s. When Arn was eleven years old, the Khmer Rouge invaded his village. They told everyone in the village that the U.S. was going to bomb them imminently and, therefore, everyone needed to leave immediately. Arn and his family (an aunt, three sisters, and a brother) grabbed what they could and began to walk with the rest of the villagers, following the Khmer Rouge. They walked for days with little food and water, watching neighbors die on the side of the road from starvation and exhaustion. Soon, Arn and his family were sent to separate camps. Arn was sent to a children’s work camp, where the kids were forced to work rice fields during grueling hours with very little sustenance. The Khmer Rouge attempted to find and kill anyone wealthy, high-ranking, or well educated. A pile of dead bodies grew, reeking and exposed, near where the children worked the rice fields. The Khmer Rouge instructed the Cambodian people that it was now “Year Zero.” Everything was starting anew and from scratch. All past knowledge was to be forgotten. Traditional songs and music were banned, and the Khmer Rouge intended to kill all traditional musicians. But before they did, the musicians needed to teach children how to play the instruments (not so they could play traditional music, but so they could play new songs, honoring Angka). Arn saw music as a way to be important, a “little famous,” and thus less dispensable than the other children. He volunteered to learn how to play. His first teacher was given five days to teach Arn and the other volunteers how to play the instruments. If the children did not learn, they were killed. To avoid death, Arn spent every free minute practicing. He learned to play traditional instruments and was thus spared his life. But when Vietnam sought to conquer the Khmer Rouge, the Khmer Rouge did not have enough soldiers to fight them. They needed new recruits, so they turned to the children. Arn was given a gun and forced to fight on the front lines. Like all trauma survivors, Arn can recall certain experiences in chilling detail; others he can tell only in vague generalities. For instance, he can describe the eerie click of a land mine being sprung and the hideous stink of a gangrenous leg. But he can’t remember the name of the little girl who lost her leg or when or where the attack took place. So I added to his recollections with my own research— and my own imagination— to fill in the missing pieces. The truth, I believe, is right there between the lines. In an effort to retain his voice, she attempts to emulate his grammar and syntax in the book; it is written in first person with Arn narrating. Overall, the book is an extremely informative look at the “worst genocide ever inflicted by a country on its own people” (“[n]early two million people died— one quarter of the population”). It is engaging and educational. But the intentionally bad grammar and syntax isn’t particularly easy to read. And, at times, it seemed forced and condescending. I know what this is. It’s liver. Human liver. From someone just killed. Still bouncing on the plate. I do what he says. I do this. I cook it. I fry this human flesh. We live here a very long time now, more than one year, on only rice soup. No meat, no fish, no spice. A body with no meat for one year has a big belly full of nothing, skin like lizard, gums all black. And this thing in the frying pan, it smell good. So good I want to eat it. I want to eat this meat. I want to. I am so hungry and it smell so good. At times, some of the anecdotes came off as embellished for shock value (and I think they probably were). But it is essential to note that this excerpt is not an outlier. The book will make you cringe. Often. If you don’t like or can’t handle that excerpt, this is not the book for you. Who should read it: Sergio (i.e., people who prefer non-fiction but feel like they would benefit from reading some fiction from time to time); people who are interested in learning more about the Khmer Rouge but would like something a little less dry than your standard non-fiction fare; people who like the excerpt above (which is a pretty good representation of that for which you’re in store). This entry was posted in Rating: 3/5 and tagged Arn Chorn Pond, Book review, Books, Cambodia, Khmer Rouge, Never Fall Down, Patricia McCormick. Bookmark the permalink. ← Why Is It So Hard to Find a Good Wedding Reading?